HOW TO: Score awesome gifts on your own social media feeds! The holiday season is officially in full gear and it’s the most mobile shopping season yet. But is it really possible to swipe, scroll, and tap your way through a stress-free holiday? Yep, it sure is — especially if you know how to train your social media feeds to do most of the work for you. You know those ads that pop up when you’re scrolling through your Facebook or Instagram? I used to just ignore them, but then my mom got the whole family those Bombas socks that kept popping up in her news feed. She liked them because you buy a pair and they donate a pair to a homeless person. And it was the perfect “something for everyone” gift. It also got me thinking about my own holiday shopping and whether I could score some great gifts right from my news feeds. So, I did a little shopping experiment and it worked! The trick is to train your feeds to work for you. It’s not hard to do, especially with a little fine tuning. The next time you’re surfing through your Facebook or Instagram feed and come across an ad, take a second to either give it a thumbs-up or edit it through that little button with three dots in the upper right-hand corner of the ad. 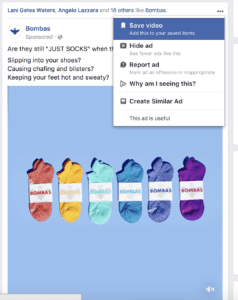 If you click “manage your ad preferences,” you’ll see the audiences you’re a part of and the information that influences which ads Facebook serves up to you. You can also view and adjust your preferences, and even more fine-tune it to curate content just for you. On Instagram you’ll see the option to “Shop Now ” within the post, and which of your friends and family have liked the same ad — which hopefully means that they will like receiving the gift too. Don’t like an ad? You can either stop seeing that particular ad, or any future ads from that business, by going back to those three little dots at the top right corner of the ad . You can even report the ad to Facebook if you sense something fishy with the ad or business. And, let’s say you purchase something from an ad, but it’s not what you expected. You can go to the “recent ad activity” tab in your setting and let Facebook know about your experience. Between just these two social feeds, you can shop at tens of millions of businesses — most of which are small businesses. Be sure to follow businesses, brands, and shops you like – that gives you access to new product announcements, hot deals and pop-up sales. Marketplace is also a great tool to both buy and sell locally as well. I spent the last two weeks shopping my own Facebook and Instagram feeds and scored some great stuff! Of course, I went back and bought more of those Bombas socks. Just following in my mom’s footsteps here, they make perfect stocking stuffers for the whole family, and help humanity too. Sorry to steal your idea Mom – but it’s genius! Also on Facebook, I found these Quip electric toothbrushes. These seem to be a big Millennial must-have this year and I wondered what all the fuss was about. Well – they’re pretty awesome and now everyone in my family is getting one too. They’re super small, and run off of an AAA battery. Every three months, the company sends you a new soft brush head and battery, and even toothpaste if you subscribe that plan. The brush also vibrates for two minutes, so that you brush your teeth for the recommended amount of time, and it pulses every 30-seconds to let you know how to shift to another part of your mouth and keep brushing! 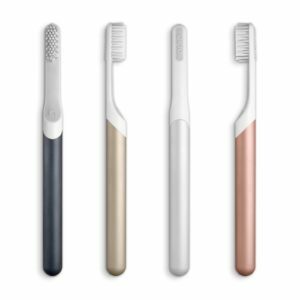 It’s the combination of a smart design and a simple, recurring subscription that makes a a toothbrush a great gift. From Marketplace, I was able to snag an iPhone X. Yep, the coveted luxury item that’s sold out in stores and taking several weeks to arrive, was an easy fine just a few miles away from where I live. I also scoured Marketplace for some of the other big must-have’s of the year and was able to find PlayStation VR, Fingerlings, Hatchimals, a Nintendo Switch, SNES Classic, and a few other hot finds also sold out at most traditional retailers. Moving on to Instagram, I picked up one of the must-have gifts of the season – I saw that my teenage daughter loves Fenty Beauty. I had never heard of it, but it’s a must-have for her and now that I’ve found it, a must-have for many women in my life. This is Rihanna’s company and it has a simple motto — beauty for all. The company is not merely paying lip service to that concept, either. Fenty Beauty has grabbed headlines since its launch for being super inclusive and for catering to women of all skin tones and backgrounds, courtesy of the 40-shade foundation range. What a fabulous find! I also found these awesome little hair-tie bracelets from Maria Shireen. I have long hair, so does my daughter, and we often wear a hair band around our wrists. They leave marks in our skin and aren’t that comfortable. 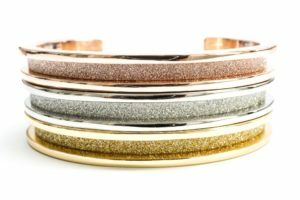 These bracelets are a gorgeous, and look fantastic accessorized with a hair band. Genius. Here’s a list of every single thing that I found and bought shopping from Facebook, Instagram, and Marketplace. And you can find descriptions, prices, and links to everything here. Remember to be a safe and smart shopper online and off this Holiday season and beyond. Make sure an item’s legit – ask for and look up the serial number, make sure it’s not recalled and don’t be afraid to ask specific questions. Be extra cautious with high value items, like cars, or even iPhones. Meet in a safe, public place like a grocery store, police station, or coffee shop. Protect your privacy. Don’t share your financial information (example: bank login and password, bank account info) with buyers or sellers. Use cash or person-to-person payment methods. When buying from a website, make sure it’s secure by looking for https in the address (the extra “s” is for “secure”) and for a lock symbol. Also – double check the company name spelling — fraudsters often take well-known brands and create a copycat website with a few extra words in the URL. Don’t click on unsolicited links in emails or via messenger. Use secure connections, update your browser, antivirus and operating system. Be sure to share your haul with us via social media – Jolly Holidays!